I was on my way to work one day, walking down a hill, when I noticed that there was a rather large snail on the ground. He was about an inch and a half long, his shell a delightful contrast of pink and pastel hues to dark brown banding. I wanted to take a picture, but I didn’t have something to carry him to work (where I have an infinity board and white box), so I decided I’d just grab my camera on break and bring him there. Of course, my break was in a couple hours, and I was praying that he’d still be there when I went outside. I grabbed the camera and tripod and ran up the hill, looking for a small shell casting a shadow on the concrete. I found him crushed, splayed out in strands of mucus, most likely stepped on by some careless person. 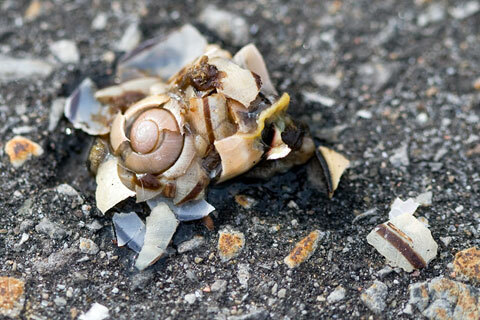 Snails can’t live without their shells, as the calcium carbonate structures hold their internal organs. I took a few pictures of the tragic scene anyway. When I got home that night, I happened to look at the snaps in quick succession and noticed that parts of him were still moving. I took a few frames and overlayed them to make this Flash animation, where you can see his foot wriggling, as well as some indistinguishable entrails that remind me of liver. It’s so sad to think that he was left out to die a slow death with his innards exposed. I would have named him Shelly. I wish I was playing paintball today. @Vi — Yeah, it is rather creepy. But sometimes the most beautiful things are also the most morbid. @Sophia — Yeah, I was reading on Wikipedia how snails can be considered pests because of how much vegetation they eat. They’re rare around here though, especially ones that big, so it was something special. It’s funny, Jen only went to play paintball because Amy agreed to play. Lin chickened out, and they were wondering what other friends would come. So they agreed that you’d have no problem but Steph would be screaming the whole time. And I still hate worms. I will torture those any day. Dead snails now make me very sad. I never imagined that I’d feel sorry for a snail either. 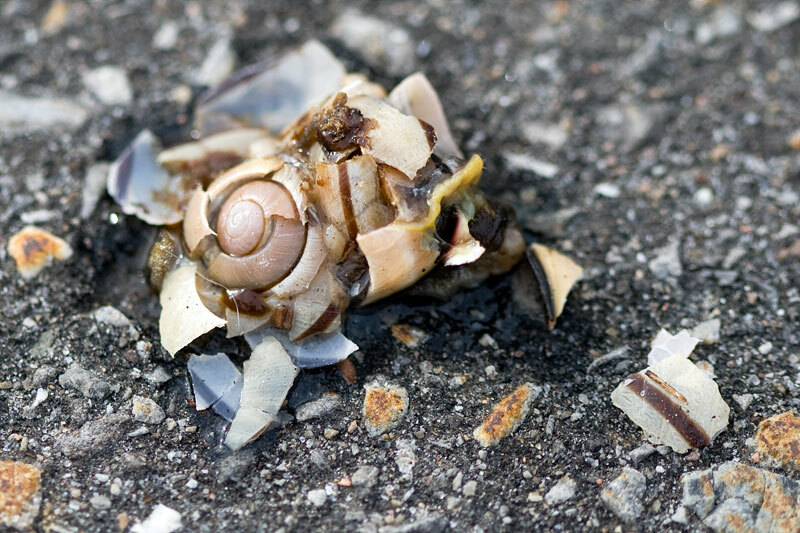 I think the fact that the snail is so large and prominent from the use of a macro lens, and the way we see his fractured shell, is what makes it so tragic. That he has a recognizable parts to him — a foot, an organ — it almost personifies him, allowing us to identify. When I was little I collected snails in a little tupperware container. I had moss and dirt in there, and every once in a while I would add water. Then I would put fish food in there to grow nastiness for them to eat. They lived for years, until my mom decided to release them. But they were happy snails when they lived with me! I remember catching (finding) a small snail once when I was young. I kept it in one of those clear film roll containers, and gave it some water. I showed my grandmother, and the next thing I knew the lid was up and it was gone. As a child, I thought it escaped and lost it in the house somewhere, but thinking about it now, I suspect my grandmother threw it out because it grossed her out. I hope it did escape though. I had no idea that wild snails could be domesticated like that and live for that long.